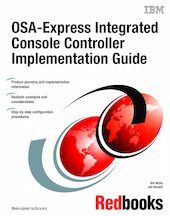 This IBM Redbooks publication discusses how to plan, implement, and configure the Open Systems Adapter-Express Integrated Console Controller (OSA-ICC) function. The OSA-ICC function is supported on OSA-Express2 and OSA-Express 1000BASE-T Ethernet features for System z9, zSeries 990, and zSeries 890 servers. The book focuses on the hardware configuration and software definitions needed to provide connectivity from the operating system to the TN3270E client emulator program. It provides information for planning purposes and system setup. Helpful utilities and commands for monitoring and managing the OSA-ICC environment are also included. This book is intended for system engineers, network administrators, and system programmers who will plan and install OSA-ICC. A solid background in OSA-Express, HCD or IOCP, and TCP/IP is assumed.